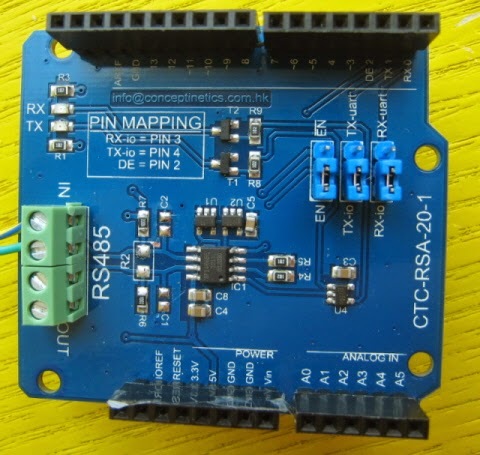 I have purchased following RS-485 Shield. There was no manual ( just like I expected :( ), and shockingly schematic was not included. This was unexpected. Guess I should be thankful that they replied. Although it is not shown on the schematic, there is a Jumper to allow the use of Soft Serial Port. There are 3 Jumpers; however, Arduino Uno only has one Serial Port so we are going to use Soft Serial Port. DE is only set to 'H' when transmitting, and at other times ( receiving ) DE is set to 'L'. At other times Soft Serial is same as general serial, thus we don't have to care.